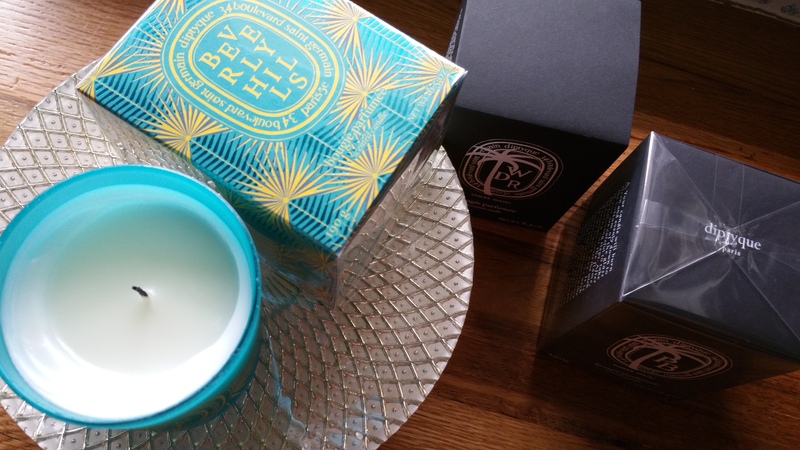 The three Diptyque candles in this post are a bit tougher to find than others, but totally worth the effort. Left to right: Diptyque / Tomas Maier Palm Beach candle, Diptyque Beverly Hills candle, and Diptyque / Tomas Maier West District Road candle. 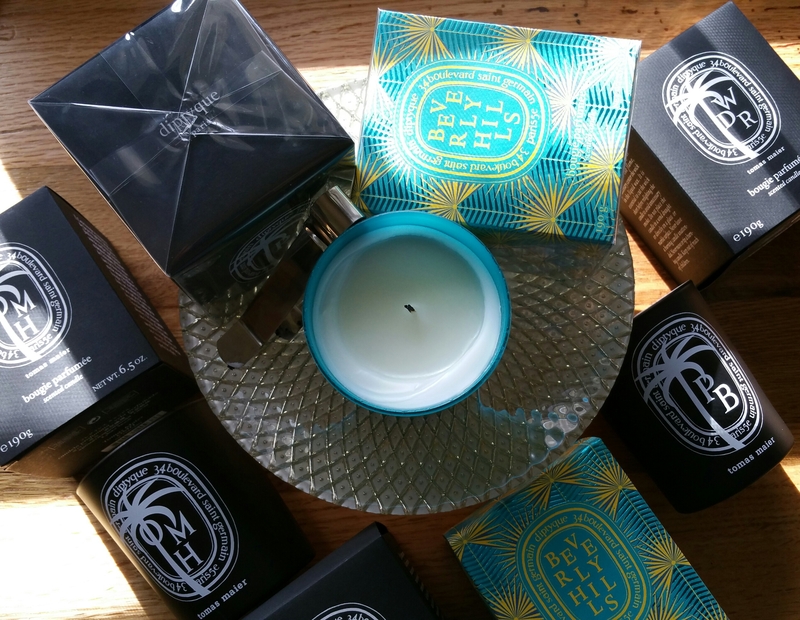 I’ve recently added to my Diptyque collection the other two Tomas Maier collaboration candles: 1) Palm Beach and 2) West District Road (I reviewed Old Montauk Highway back here); and the 3) Beverly Hills candle. 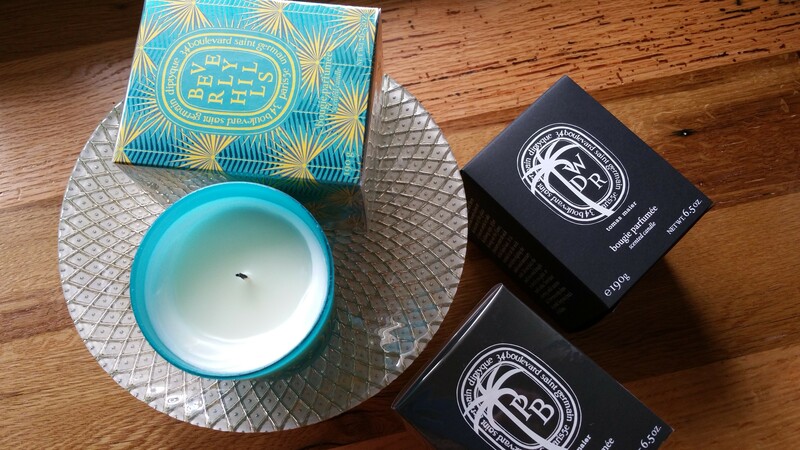 All three are “boutique exclusives.” Typically Diptyque boutique exclusives can only be purchased from a physical or online Diptyque location. But the Beverly Hills candle is exclusive only to one such boutique — aptly, that is the boutique in Beverly Hills, California. Luckily for us, that boutique has both a telephone number and an email address, and can ship orders! When I found this out I quickly took advantage and was able to get my very own Beverly Hills candle. 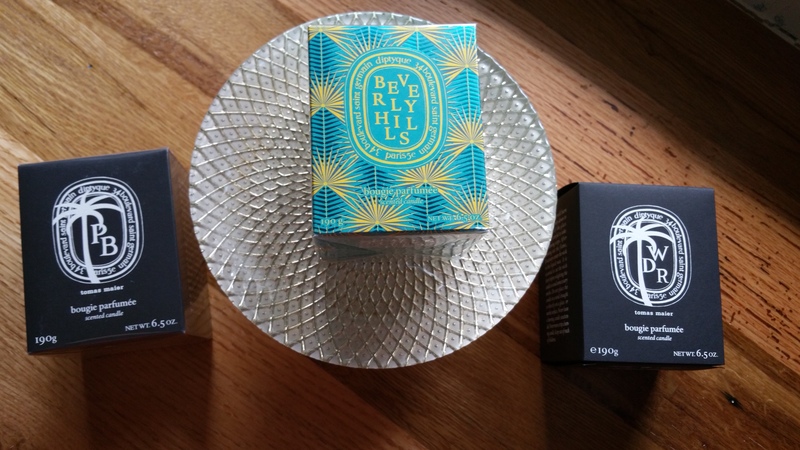 On top of all that, the experts in BH are also friendly and helpful, and I was given permission to include their contact information for you all: Phone: (310) 385-5941 /Email: northbeverly@diptyque.us. I have worked with Allison and highly recommend asking for her! Diptyque Boutique Exclusive Candles: Tomas Maier Palm Beach; Beverly Hills; and Tomas Maier West District Road. Before getting to the Beverly Hills candle “experience,” I’ll tell you about Palm Beach (“PB”) and West District Road (“WDR”). First thing is that I was correct back when I speculated that I’d like Old Montauk Highway (“OMH”) the best out of the three Tomas Maier collaboration candles. This was based on the scent descriptions from Diptyque’s website. I did wish that WDR would turn out to be my favorite, because it’s named after a place in Maine (I ♥ Maine. I spent summers there as a child). On the other hand, I am not really a huge fan of Long Island, NY, where OMH is found. But I love the candle. And Palm Beach, of course, is a great place. But it’s tough to get cozy there for under eight-figures. Anyhow, when I made my first Tomas Maier purchase, PB was not in stock so I was only choosing between WDR and OMH. While I was on target about OMH, I was wrong about my expectations for PB. Based on this description: “a walled, tropical garden on a southern Florida barrier island featuring scents of jasmine & iris, lemon & lime trees, salt from the sea and fresh cut grass,” I was anticipating that PB would be overly jasmine-smelling. In reality I can hardly even isolate the notes of jasmine when I’m burning the candle. The candle sends up an impression instead of a bouquet, which I’m sure is what Tomas Maier and Diptyque intended when using the name of a place for the candle. Palm Beach is clearly a floral candle in my mind, but clearly not a reproduction of a single iris, rose, or lily on its own. The thing I really like about PB is exactly what makes it different from every other “tropical” or “beachy” candle in the world. Palm Beach does not smell anything like a coconut, or a mango, or a piña colada. Tomas Maier makes those other candles look totally ridiculous and unsophisticated. He’s taken things to the next level. Just as I see the genius in Palm Beach, I see it as well in West District Road. As soon as I dislodged the first flap of the plastic, candle box, over-wrap, I was looking around my kitchen to see who had cut up some celery. Cut celery is exactly what I smelled from WDR. It’s funny because I never even thought about the smell of those green stalks until that moment. The celery smell did get “watered” down, and mellowed as the candle burned. But it didn’t disappear. As you can imagine, Diptyque’s description of WDR says nothing about celery. Instead it mentions a “saltwater farm of a Northern Atlantic island plush with ferns, fir and birch trees, hay, wild iris and meadow rose, moss and sea mist.” I guess the ferns, hay, and moss come across to me as “celery” because my brain doesn’t really have anything else with which to compare the scents of the candle– I haven’t seen or smelled New England ferns, meadow roses, moss, or (sadly) sea mist, in ages. Now for a quick trip across the country, to the West Coast. I suppose there is really no better way for Diptyque to physically represent the mysteries of fame and stardom than to create a candle so fabulous that everyone wants it, but can only get it from one zip code. And that’s exactly how it went. Anyone outside of the general SoCal scene could read about the Beverly Hills candle and see its image splashed across their PC and mobile screens. But they could not grasp it for themselves. Diptyque / Tomas Maier Palm Beach candle, and Diptyque Beverly Hills candle. Forgetting for a minute that I was able to have all of this, (and more! ), shipped to me in a State with no ocean, no palm trees, and pretty much no style (lol), then we can stop right here and congratulate Diptyque on an awesome release. And that’s even before we’ve held and smelled this darling for ourselves. Like everyone else, I’d heard all great things about the Beverly Hills candle, and I’d read about the wall-paper inspired jar decoration and uniquely fresh vibe to this candle. But the experience of having it to myself and holding a match to its wick made me feel starstruck. My first thoughts were that this candle smells nothing like any Diptyque candle I’ve smelled (and I’ve now smelled close to 60 of them). I love it because it’s fresh and smooth like lemon gelato, but it isn’t pungent like the other fresh smelling candles of Diptyque: Eucalyptus, Menthe Verte, and Verveine. And the only candle of Diptyque’s that even orbits close to “lemony” is Verveine, which is an herbal candle. Have you noticed that there are only five candles listed under the “Fruity” category on my Diptyque reference sheet? And one of those is a limited edition candle (Coing), while another one of them could really be considered a Floral (Baies). So that leaves Oranger, Figuier, and Oyédo to fill the entire fruity space. Since I’ve already addressed it here, I’ll simply say that I think Oyédo is the only really enjoyable, fruity candle in the entire Diptyque line… until now that is. I hope I don’t offend anyone by saying that BH is fruity. I mean it in the best way possible. I’m referring to the smell of lemon oil mixed with mint. Once again I want to champion Diptyque for staying far away from those apparently tempting (to candle makers) smells of coconut and tropical fruit. 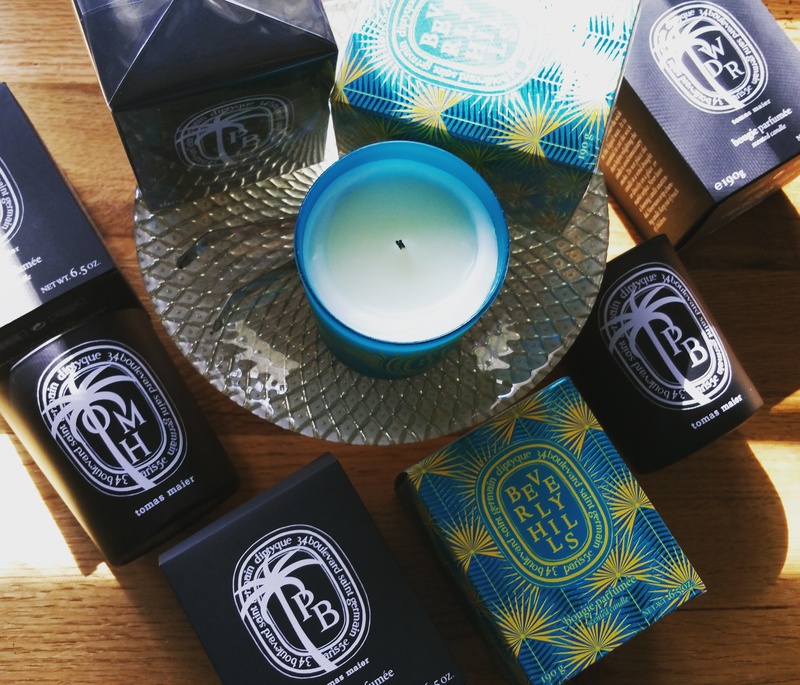 Diptyque Boutique Exclusive Candles: Tomas Maier Old Montauk Highway; Tomas Maier Palm Beach; Beverly Hills; and Tomas Maier West District Road. 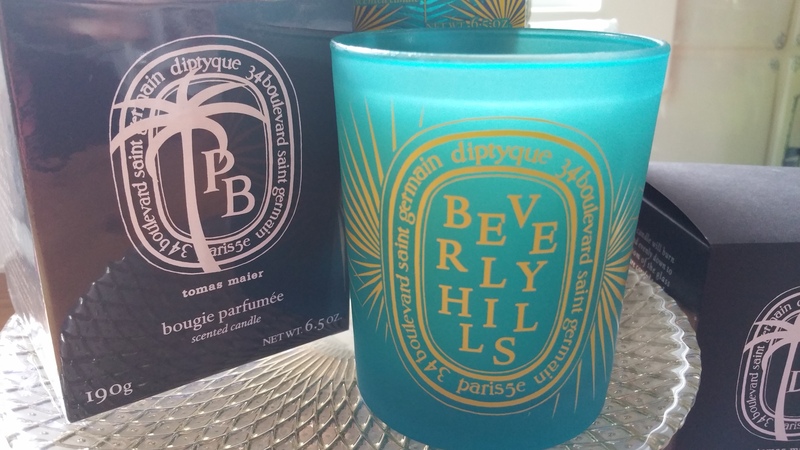 I think I’ve made my case for why the Beverly Hills candle is so exquisite… and for why Diptyque should add this candle to their permanent line up! I mean, there is a huge, wide, Pacific Ocean sized gap in Diptyque’s repertoire for just this candle. …So. Will you sign my petition on this issue?